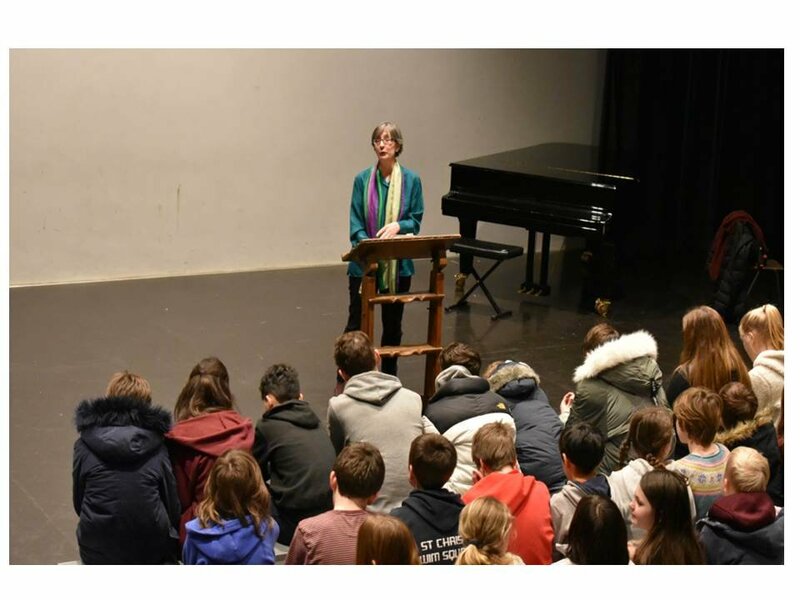 Helen Pankhurst, CBE, came to talk to Senior School students on Thursday, 10 January about equality and her new book ‘Deeds Not Words’. There are few names that can be instantly recognised by all and instil a sense of wonder and intrigue at their mention, but the packed theatre and eager faces of our students and staff last Thursday clearly proved that the surname ‘Pankhurst’ is among them. We were honoured, delighted and slightly giddy with excitement to receive an insightful, informative and inspiring interactive talk from Helen Pankhurst CBE, great granddaughter of Emmeline Pankhurst of suffragette fame. A renowned international women’s rights activist in her own right, Helen shared her knowledge and enthusiasm with us. Having sent her own children to St Chris, and having already met the staff and students involved with the ‘Processions’ march in London last year, Helen was instantly at home! She raised some interesting and thought-provoking questions for her young audience. How did we get to a democracy where women get the vote? How far have we progressed? And what do we still need to do? Here’s what we learnt. How did we get to a democracy where women get the vote? How far have we progressed? Out of 5, where 0 = no change and 5 = everything is sorted, St Chris students on average felt that we were at a 3.5 when it came to progress in opportunities for women, identity, economics and power. The children have spoken. It seems there is work to be done! With media forcing our viewpoint, social media pulling us back towards narrow stereotypes, pay issues and men still dominating senior roles, Helen pointed out that although there have been “phenomenal changes” there are still issues that need to be addressed. And what do we still need to do? A heartfelt thank you to Helen Pankhurst for giving us her time, impressive knowledge and ideas on the history and future of women’s rights. If you or your children would like to read more about the subject or Helen, her brilliant book ‘Deeds not Words’ is out now.